All regional innovation practitioners are invited to join a two day training tour on 8th and 9th March, in Perth and Geraldton. The purpose is to build capability in those leading innovation in the regions through their work as facilitators, entrepreneurs, incubator hosts, support service providers, and in government. The tour will include specific training modules, workshops, networking and time with the people behind incubators, accelerators and investment programs. This face-to-face activity complements the online training modules and practitioner network. 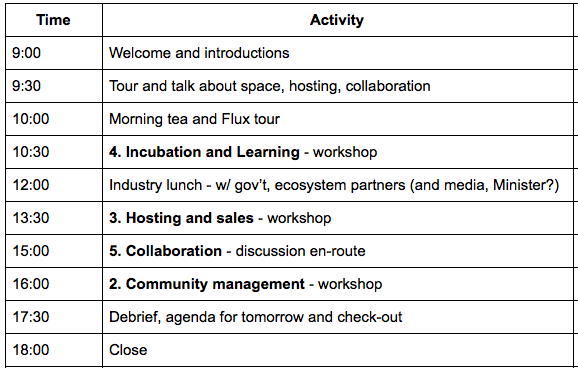 The tour will provide participants with on the ground training in the operational aspects of coworking, networking and learning programs, develop collaborative projects and share learnings with other regions, as well as developing updated action plans for progressing ventures and professional development. The tour comes at a particularly relevant time as regional innovation facilitators state wide look to form collaborative partnerships to access funding from the State, and Federal Incubator Fund. With the tour already attracting participants from the Pilbara, Mid West, Metro area, and South West of Western Australia, it will provide invaluable network connections and relationship building opportunities, as well as the chance to meet and greet with local industry and sector partners. The tour builds on work carried out by Meshpoints over the past 12 months to support strong innovation ecosystems across regional Western Australia. By recognising the unique challenges and opportunities in our regions, Meshpoints are able to engage relevant practitioners and spaces that have “been there, done that” to ensure lessons learnt aren’t lost along the way, improving sustainability and efficiency of financial spend for partners and funders alike.